Imagine stepping on a sharp pebble. Usually your first reaction is to pick your foot up as quickly as possible so you’re no longer standing on the little rock! You might limp around for a few seconds until your sole feels better, but at least you no longer have a painful object pressing into your lower limb. If the “pebble” or bump you step on happens to be a swollen tissue inside your body, however, the problem isn’t going to go away on its own. Every step will be painful. This is the case for someone with a neuroma. A neuroma is a pinched nerve or a nerve tumor—a benign, though usually uncomfortable, thickening or growth in the nervous tissue. There are several ways it can form, but often it is related to irritation or trauma to the nerve. Rubbing, pinching, and sudden injuries can lead to painful swelling and inflammation. Since the nerve is then enlarged, using your foot also causes the damaged tissue to rub against other structures, aggravating the condition. While this can develop in almost any of the nerves in your feet, the one most commonly affected sits between the third and fourth toes. 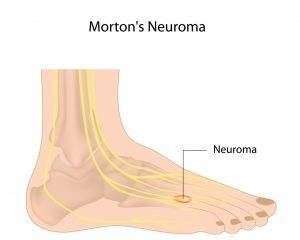 This is called Morton’s neuroma, and it can cause pain in the ball of the foot, tingling, burning, numbness in the toes, or even the sensation that you’re standing on a pebble. Since continued use tends to make the problem worse, neuromas generally do not get better without intentional intervention. The good news is that you have no reason to continue to suffer with your ball of the foot pain. Dr. Joel W. Brook, Dr. David R. Northcutt, Dr. Irene Arroyo and Dr. John Baca can offer you real relief from your discomfort and help you regain any mobility you may have lost from the discomfort. The doctors will perform a thorough examination of your feet and ankles to be sure you don’t have a stress fracture, metatarsalgia, or arthritis, which can have similar symptoms. They may request different diagnostic images, like digital X-rays, to be sure. Once they’ve properly diagnosed a neuroma, they can begin looking for the cause and for the best solution to eliminate your foot distress. You’ll need to relieve pressure on the damaged nerve and reduce the swelling in the area. In most cases, this can be done conservatively, or without surgical intervention. You may need to change your shoes or add orthotics to provide extra padding under the injured structure or correct any preexisting conditions that are adding pressure to the balls of the feet. Resting the foot, icing the painful area, and massaging out the ball of the foot can all help as well. For stubborn discomfort, you may need a minimally invasive radiofrequency nerve ablation, or our NeuroTherm® procedure. This device disrupts the pain signals from the damaged tissues, offering you real relief. If all conservative measures fail and you find you still struggle with the discomfort, you may need surgery to decompress or remove the damaged section of the nerve. Neuromas are irritated and swollen nervous tissues that can cause you intense pain and keep you off your feet for a while. You don’t have to let them control your life, however; with a little conservative intervention, you can restore your feet and ankles to good health. If you let the problem compound for too long, though, it can worsen to the point that only surgical intervention will help. Don’t wait until an invasive procedure is your only option for pain relief. Contact Dallas Podiatry Works for more information or an appointment and take care of the balls of your feet. Call either of our two offices—(972) 566-7474 for the Dallas location, or (972) 943-3323 for the Plano office—or visit the website contact page to reach us.